When most of us want to get a hold of someone quickly, we pull out our smartphones and send a text message. In healthcare, however, communication becomes more complicated. 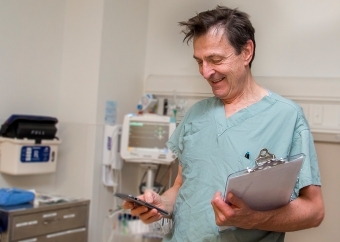 That’s why Niagara Health has become one of the first hospitals in Canada to adopt a new app for physicians, which makes it faster and more secure for them to communicate with one another on their personal devices. Working with IBM and Vocera Communications, Inc., Niagara Health designed and deployed an innovative smartphone app called qConnect that allows our physicians to instant message each other through their own phones. Jeff Wilson, Niagara Health’s Director of Information and Communications Technology (ICT), says doctors can now share test results and other key patient-related information with the click of the send button, ultimately resulting in more timely care for patients. The use of pagers has been the mainstay of communication for doctors in hospitals since the 1980s, says Dr. Rafi Setrak, Niagara Health Chief of Emergency Medicine and clinical lead for the qConnect project. Unlike a paging system, qConnect lets the user know when a message has been sent, received and read by the correct person in one easy step. It also includes built-in contact lists, which allow users to reach the on-call physician without having to know who is on call. Most importantly, the information shared is secure as it is stored on servers housed on Niagara Health property, says Tammy Chaput, Niagara Health Information and Communications Technology Project Manager. Niagara Health’s ICT department worked with the hospital’s doctors to customize the app to specifically meet their communication needs.